The collapse of the Russian Empire and the rise of Communism was a terrible disaster for Buddhism. RIR looks at this dark period in Russian for the religion that originated in India. After the 1917 revolution, Buddhists, along with members of other religions, were the target of repression from the new authorities. When they had to altogether abandon their religions in the beginning of the 1940s, there were practically no remaining clergy or churches. The Soviet government sought to build a communist society free from religion. As the mainstay of the Russian Empire was Christian Orthodoxy, it was dealt the first blow by Communism. Arrests and executions of the clergy, as well as the nationalisation of church property, began almost immediately after the revolution. The communists employed a slightly different approach with the Buddhists. First, it was profitable for the Communists to play the role of liberators to the Kalmyks, Buryats, and Tuvans, who had been “oppressed minorities of the Tsarist regime.” Then, the Bolsheviks wanted to win the support of the Dalai Lama and the Buddhists to promote “world revolution” in the Buddhist East. But as soon as the Bolsheviks realized that this was not possible, the gradual destruction of Buddhism began. In the 1920s, the Communists tried to influence the Buddhists and the Buddhist clergy through persuasion. However, the anti-religious propaganda failed all the way until the 1930s, and the influence of the Soviet authorities in “Buddhist areas” – Kalmykia and Buryatia (Tuva finally returned to the Soviet Union at the end of WWII) – remained weak. Authorities could not long endure the fact that socialism struggled to grow in “the thick of Lamaism and primitive beliefs” and the Buddhist clergy became a “huge sore on the body” of the Soviet population. Therefore from the beginning of the 1930s propaganda went by the wayside, giving way to harsher measures. In 1931-32, the highest-ranking members of the clergy were persecuted, and in 1935-36, the remaining members of the middle ranks of the clergy were arrested. However, the population census of the USSR in 1937 discouraged the Soviet authorities by showing that even repression could not eradicate religion: a quarter of the population of Buryatia and Kalmykia continued to consider themselves believers. Then the Communist Party decided to do away with religions and begin its campaign of mass terror, including against Buddhists. Just as with Orthodox priests, Buddhist priests were accused of plotting against the government by spying for Japan and planning direct hostile acts against the Soviet Union. In 1937, it was announced that the lamas were actively involved in subversion and sabotage, including, plotting to blow up a series of bridges. Allegedly, photographs of these objects were found in the lamas’ possession. In the then independent Republic of Tuva, the situation was not much better. In 1930, the seizure of temples and monasteries and pogroms began. Temple property was confiscated and destroyed. The most valuable property were xylographs (wooden engravings). The Aga temple had 100,000 pieces of such engravings. Most of these engravings had no religious content, but ranged from dictionaries, grammar guides, narrative and poetic literature, and essays on history, medicine, astronomy, and philosophy. No less valuable were lone original manuscripts which went missing even in Tibet, as well as thangka – works of Buddhist art. In the ranks of the militia, which was engaged in the expropriation of the property, the pages of manuscripts were used to cover windows and were used as tissue paper and papier-mâché; the most valuable xylographs were thrown into the street, where they rotted. Priceless books were tossed in the oven. Fabrics with sacred images of the gods were wound around the feet as foot wraps. Religious buildings were destroyed completely. For this purpose, Communists Komsomol (Communist Youth) members were mobilized, especially by non-governmental organizations and activists. At the end of the Great Patriotic War (World War II), Stalin softened his stance on religion, which consequently affected Buddhism. In Buryatia, the Defence Fund of the USSR donated several hundred thousand roubles to Buddhists, and then legalized Buryat Buddhism, although it came under the control of the KGB. 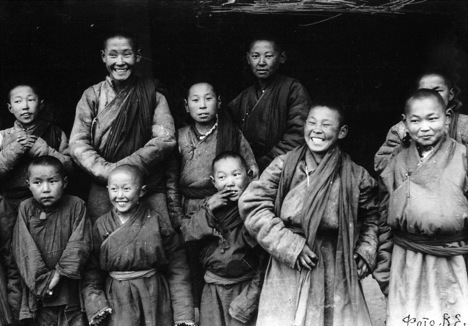 In 1946, in Buryatia , two documents were accepted, officially marking the return of Buddhism to life – the ‘Charter of the Spiritual Administration of the Buddhists’ and ‘Regulations on the Buddhist clergy of the USSR.’ However, by signing them, Buddhists pledged “to esteem to make their sacred Buddhist faith on par with workers in the homeland and foster its strengthening and flourishing.” Like other religions, Buddhism was a focus of the KGB up until Perestroika, when, beginning in 1987-88, the persecution of Buddhism ceased completely. This article was written based on the materials presented at the ‘Buddhism Repressed’ exhibition in the Gulag Museum in Moscow.